What is a Channel Feed Widget and what is it used for? 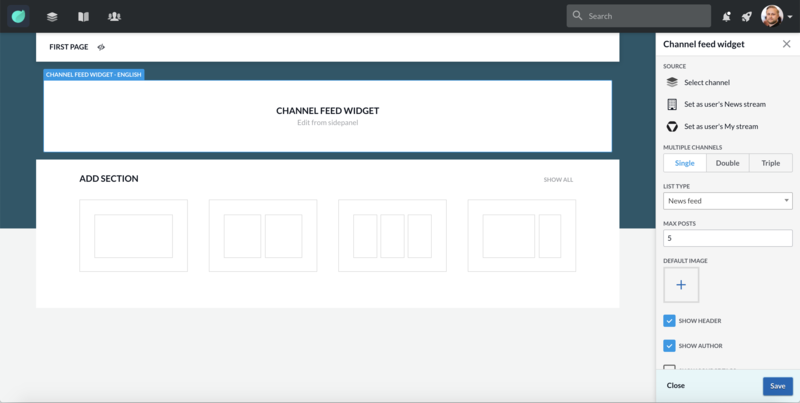 Channel Feed Widget allows you to create a Channel feed on a Page directly from a specific Channel. Select channel: Choose specific Channel from list of Channels. Set as user’s news stream: Set to users personalized News stream. Set as user’s my stream: Set to users personalized My stream. Multiple channels: Decide on one, two or three feeds. If you have more than one feed the additional feeds will show as tab. List type: Pick layout type for the preset options. News feed, blog feed, medium, tiny, carousel, banner or mix. The following options depend on the type of layout you pick. Max posts: Choose the max number of posts displayed. Default image: Decide on a default image for channels that are missing images. Show header: Hide or show header with channel name. Show author: Hide or show author of the post along side the page preview. Show source tags: Hide or show channel category icon. Show channel tags: Hide or show channel tags. Limit height: Limit height of posts.